Welcome to the Transportation Department, which is responsible for the safe and timely transportation of students attending Chardon Local Schools. Each year our buses travel over 513,000 miles covering the transportation routes leading to school and home again. We want to provide a quality education for your children; but realize, because we bus 85% of our students, that safe transportation must also be a high priority. 2018-19 Bus Routes are currently being updated. Stay tuned to this page for a posting of the updated routes. Thanks for your patience and understanding. In addition to the information provided below, please see the available downloads and links on this page for additional resources. •	Observe same conduct as in the classroom. •	Keep the bus clean. •	Cooperate with the driver. •	Stay in your seat. •	Keep head, hands and feet inside the bus. •	Bus driver is authorized to assign seats. Students shall arrive at the bus stop before bus is scheduled to arrive. (ORC 3301-83-08 C-1) Chardon Local Schools requires students to be at their designated place of safety five (5) minutes before the bus is scheduled to arrive. 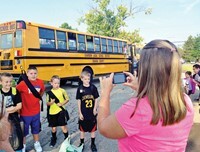 The Ohio Revised Codes listed above are some of the laws that school bus drivers are required to follow. The students who ride the bus are also required to follow these laws. Please see the Ohio Pupil Transportation Operation and Safety Rules for a complete reference for school transportation management. Chardon Local Schools may require students to walk up to one-half (.5) mile to a designated bus stop as defined by ORC 3301-83-13 (B). For example, students living on cul-de-sacs less than one-half mile long may be required to walk to a designated bus stop at the nearest intersection. A bus may travel a street if using it for a turn-around. A list of streets and designated bus stops meeting this criteria can be found in the downloads section of this page. Bus passes are required for all elementary and parochial students in the district not going to an assigned stop associated to their home address. Bus passes are NOT issued to Chardon Middle School or Chardon High School students. Students are not permitted to change buses or get off at another stop without approval. Parents, please send in a signed letter to be given to the school office. The office will generate a bus pass and your child will need that pass in order to board the bus. If they do not have a bus pass, they will not be able to ride or get off at the stop requested. Bus passes are only issued if space exists on the bus for additional passengers. Please be aware that we may not be able to accommodate your requests until two (2) weeks after school begins. Additionally, there are Latchkey Programs at both elementary schools. Please let the school building know if your child will be attending one of these daycare centers. The building will let the transportation department know.